Adrift will inevitably headline Netflix’s playlist “Movies with a Strong Female Lead,” but this film really needs to be seen in a theatre. It’s a gripping romantic adventure on the high seas—Johnny Depp free!—as two young lovers combat the elements and struggle to survive on open water. The film sees YA franchises collide as Divergent’s Shailene Woodley teams up with The Hunger Games’ Sam Claflin to play Tami Oldman and to Richard Sharp. Tami and Richard are real-world adventurers basking in the sunsets of the Pacific Ocean on an ill-fated voyage home. A terrible storm leaves their ship ruined and adrift in the water as they cling to life against the elements. Their love story ensures that audiences will never let go while holding on to Adrift’s adventure. Woodley gets her Robert Redford moment when Adrift opens with the couple’s sailboat ruined following a storm. Richard is missing and Tami scrounges for supplies, communication devices, and any signs that he’s alive in the aftermath. The film’s best moments hinge on Woodley’s physical performance and Adrift caters nicely to Woodley’s youthful, spunky, strong-willed spirit as a fine counterpoint to Redford’s grizzled mariner of Allis Lost. Say what you will about franchises like Divergent and The Hunger Games, but they’re great training grounds for actresses to carry strong-willed personas into dramatic vehicles. Not all is lost when Tami finds Richard floating lifelessly on the boat’s dinghy. She saves him, but discovers he’s badly wounded with a shattered leg and broken ribs among his injuries from the storm. (She has some bad bruises and cuts, but nothing life threatening.) Richard might be the experienced sailor of the two, but he instilled within Tami his passion for the seas during their journey. She takes control of the sails determined to head home. Adrift invests audiences in the stakes of Tami’s voyage by cutting back and forth from the scenes of the lovers on the boat to snippets that reveal the strength of their relationship. Tami and Richard meet on the docks and they’re a great match from the outset: as vagabond travellers, they escape responsibilities by leading wandering lives and going wherever their adventures take them. As Tami guides them home, Adrift crosscuts their present struggle with their previous journey finding balance. They’re each other’s anchors. Romance on the high seas comes naturally thanks to the gorgeous sunsets that offer bright red backdrops for their growing love. Cinematographer Robert Richardson (Hugo, The Hateful Eight) fills the frame with the glowing warmth of the fading sun in these flashbacks, making perfect use of soft natural light to coax audiences into this relationship. Contrasted with the darker, greyer images of the ruined ship carrying Tami and Richard, Adrift finds bittersweet harmonies between the thrills of romance and suspense. The film builds to the fateful storm, which proves a wild white-knuckler of a ride even though everyone knows it is coming. Director Baltasar Kormákur (Everest, The Deep) stages this scene spectacularly as the roaring waves of the ocean crash down on the little boat. The intense physical performances by Woodley and Claflin ensure that Tami and Richard hold on for dear life as Kormákur pummels the boat with menacing black water. It’s a wild, exhausting rush of a sequence that leaves one breathless. 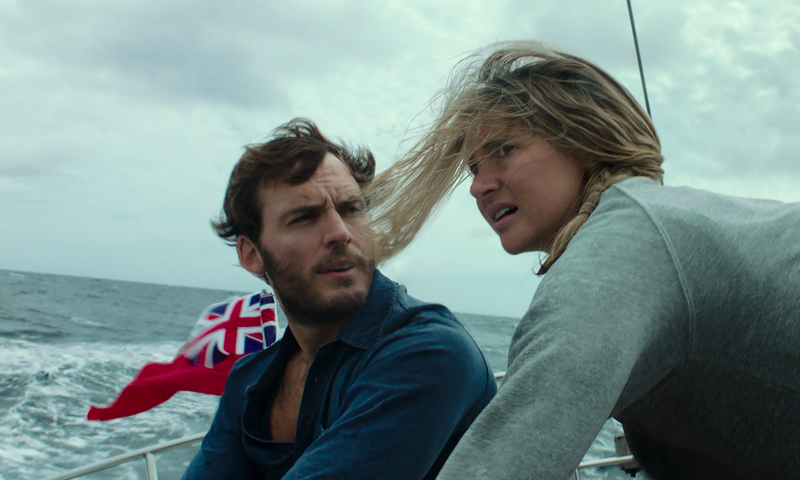 Adrift lets audiences recover only to make them gasp again with a twist they won’t see coming. True stories like these often elevate adventures since one knows that the heroes weathered the storm. Don’t do any reading beforehand and go into Adrift blind. Ignorance makes the reality of the adventure a much wilder ride. Adrift opens in theatres June 1. "May You Live a Long Life."